“Original Sacred Harp” is an all á cappella recording of songs from The Sacred Harp song book, which was originally published in 1844. This CD was originally recorded with 15 songs by “The Universal Pickers” and released on cassette tape in 1993. It has been re-released on CD by Cross Ties, the successor band, which includes three of the original members of The Universal Pickers. 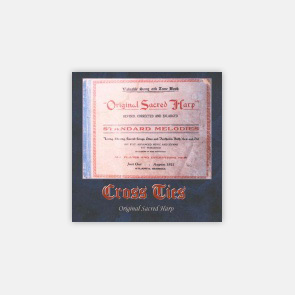 In addition to the original 15 songs recorded, the CD includes 3 bonus tracks of Sacred Harp songs from other recording projects of Cross Ties. The first 16 songs on the CD are recorded in the style of a traditional class singing, i.e., singing of the shaped notes first, then the words. The final songs on the CD include musical preludes in addition to the á cappella vocals. Click here for pictures of the CD (front, back, and inside). See the referenced review of this recording from the Wisconsin Shape-Note News below. A copy of this recording is on file at the Library of Congress. It is also referenced in the Sacred Harp Resource Guide. While at the Holly Springs two-day singing this June (1993) I had the chance to pick up a new Sacred Harp recording. Surprisingly, it is not a live recording of an all-day singing. It is called the “Original Sacred Harp” and it is performed and put out by The Universal Pickers (now known as Cross Ties). My understanding is that The Universal Pickers is a north Georgia old timey/bluegrass band, but that is not apparent on this recording. They are four young men who were taught to sing Sacred Harp by Hugh McGraw. They recorded 15 Sacred Harp tunes, while in a hollow square, singing the pitches and shapes, in Antioch Baptist Church, Buncombe, GA. Using a 4-track recorder, they multilayered a 16-voice sound on the traditional arrangements and styles of these songs. The arrangements are true to the tradition and spirit of shape note. The big advantage of this recording is the clarity and separateness of the sound. It is one of the best recordings I’ve heard for picking out individual parts, something useful to those of us still learning. This recording doesn’t possess the rowdy passion of many of the live recordings. It also doesn’t have the polish or slickness of Sacred Harp sung by pros or classical singers. Instead, it does a good job of retaining the spirit and flavor of the true Sacred Harp, while imposing a little bit of restraint and control on the finished product (restraint and control not being particular strongpoints of the Sacred Harpers I’ve run across). Copyright © Cross Ties Band - All rights reserved.